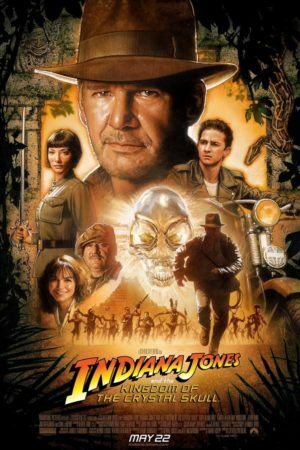 The question everyone has been trying to answer in regards to Indiana Jones and the Kingdom of the Crystal Skull - does it live up to the classic Indiana Jones films? - is inapt. Viewed with our objective caps on, neither Indiana Jones and the Temple of Doom nor Indiana Jones and the Last Crusade fully live up to the classic Indiana Jones films either; and with three-quarters of the Indiana Jones films having failed to live up meet the standards of an Indiana Jones film, it might be time to consider re-evaluating what that standard actually means, but the urgent question of whether any given movie is better than Raiders of the Lost Ark - perhaps the finest popcorn blockbuster ever produced - is a bit silly. Kingdom of the Crystal Skull stands up just fine to Temple of Doom and Last Crusade, and it does not stand up to Raiders, and this is all that a sane person would have ever hoped for. There are easy complaints to lob against it, sure: too much padding - well, Last Crusade had that endless Venice sequence. Not enough globetrotting - more than in Temple of Doom, though. It's got alien artifacts, and aliens aren't Indiana Jones! A point to the naysayers, and thereon hangs a tale. It's hardly news that Raiders was initially conceived as an homage to the great adventurer sequels of the 1920s and '30s, and it is for this reason above all else that the first three were set in 1936, 1935 and 1938. Released 19 years after the last film, Kingdom takes place exactly the same length of time later - in 1957, when the adventure serial was 20 years in its grave and Saturday matinees were no longer filled with stories of explorers in the jungle, but monster movies and Cold War paranoia tales about flying saucers and Martians. Don't worry, I'm not going to defend the film along those lines, not precisely. Aliens aren't Indiana Jones, and there's nothing that can make that element of the plot any less bizarre than it is. One of the most curious and confusing elements of the new film is that much of its first act (like Last Crusade, Kingdom isn't really structured serially, as the first two were) is pornishly obsessed with establishing that This Is The Fifties - greasers and nuclear paranoia, anti-Commie parades and anti-McCarthy whispers in the halls of academia litter the first thirty minutes of the movie. There's too much of it, and shame on Steven Spielberg for giving in to David Koepp's padded screenplay, not merely insulting the audience's knowledge of a not-so-bygone era but also dragging the film's pace down severely. But conceptually, think of what this does: the first three movies were set in a magical idea of the '30s, but Kingdom is set in a comparatively grounded version of the '50s, a place where superhero archaeologists with fedoras and whips can't help but feel out of place. Much was made prior to film's release about Harrison Ford's age (65 years), and whether this meant that the new Indy was going to be creaky and feeble. That isn't the case, but Indy is still an old man. A great deal of energy is spent (again, too much) focusing on the loss in his life: his father, his old friend Marcus Brody (Sean Connery and Denholm Elliot put in photographic cameos that drive the point home far deeper than it needed to be). It's implied that he's been keeping up his adventuring life in the 19 years we haven't seen him, but he's not the same man: where the Indy of Raiders and Last Crusade was easily flustered in his teaching gig, the Indy of Kingdom is much likelier to bring the classroom out into the jungle than bring the jungle into the classroom. He is, in other words, slowing down and settling into to an old man's life. It is not the right time for Indiana Jones. There are many meanings to that statement: that Professor Henry Jones Jr. is no longer spry enough to be a great adventurer, that the serial explorer of the '30s has no place in the mapped-out global world of the 1950s, that releasing an Indiana Jones picture in the one-blockbuster-per-year Hollywood that produced Raiders is not like releasing one in the one-blockbuster-per-weekend era of Kingdom. This is what Spielberg and Koepp and Lucas's fixation on The Fifties means, and what shoving aliens into an Indy film means: there can't be a "classic" Indiana Jones adventure now, for all the meanings that "now" holds. The clearest expression of this idea in the film comes right at the beginning: Kingdom opens in the same warehouse that the Ark of the Covenant was hidden in at the end of Raiders, but nobody involved is there for the Ark, and when that artifact makes its obligatory cameo, only the audience gets to see; nobody in the film cares about the Ark anymore, it belongs to the past. Aliens and ideological warfare, that's what the world is now. With that in mind, the filmmakers have chosen - wisely, although it might not seem like it - to make Kingdom only as good as it has to be. There was no outdoing Raiders, not in 2008 with a 65-year-old Harrison Ford. The more they tried, the more they had room to fail, and so instead of making the best possible Indiana Jones film, they simply made an Indiana Jones film - which, paradoxically, is the best it could possibly be. If we're not going be blown out of the water no matter what, better by far to be given small things done very well than large things done adequately. The film's insurance against losing us through this strategy is to constantly point out the viewer's expectations and then gently - so gently - subvert them. The Ark is one instance. The best one is also the film's opening shot, and it could not have been better chosen: the Paramount mountain fading into a prairie dog hill. It's an extremely knowing moment, in which the filmmakers give us what we want (the Indy iconography of the mountain fading into the movie), but in the smallest way possible. Is it satisfying? Yes, and one of the funniest moments in the film. Does it immediately shift our expectations from the unwieldy "amaze me" to the achievable "entertain me"? Well, it did for me. All this is as much to say that Kingdom of the Crystal Skull is without question the lowest-key of the Indy films - some would say that it's tired, I'd prefer to use "worn-out." Steven Spielberg, George Lucas, Harrison Ford, Indiana Jones and the audience - we're all older than we were, and we've all figured out that getting old means that you can't do as much as you used to do, but that's not the same as not being able to do anything at all. By no means to I wish to suggest that Kingdom is melancholic or elegiac. It is a fun summer movie without a doubt, burdened by unnecessary slow patches but name me the contemporary popcorn movie that isn't. Simply that it is an old man's adventure movie, not a young turk's adventure movie, and this is what makes all the difference. An adventure movie it is, though, and Spielberg does a fine job of waking up the long-dormant muscles that remember how to do that sort of thing. Though the opening and close of the film dither a bit, it middles very well indeed: two extended chase sequences with some moments that are very thrilling (a swordfight on top of moving trucks) and some that are goofy (swinging on vines with CGI monkeys - generally speaking, the film is at its worst when CGI animals are called upon). In a cinematic environment where there's not really anything left that we haven't seen, nothing here is as fresh as the great setpieces from the first three, but the best parts of this film easily stand up to the best parts of any other '00s CGI epic. For Kingdom is ultimately a CGI epic; it uses models and sets far more extensively than just about any other film of this scale out there, but compared to the originals it is a positive glut of visual effects. At least it has the basic decency to be an extremely good CGI epic. If there's one area where the film does come close to falling apart, it's around the acting, which is the weakest in the series (absent Kate Capshaw's notorious Willie Scott from Temple of Doom). Ford gave up on acting many years ago, and there are only a dozen points in the film, maybe, where he seems to be awake or even alive. Shia LaBeouf, as the young sidekick with the impossibly obvious twist, is as good as he has ever been, but given the prefabricated smoothness to all of his previous work, that's no kind of praise. The stand-outs are the women, happily: Karen Allen returns to her iconic role of Marion Ravenwood, and she has enough energy and sass that some of it actually bleeds off onto Ford, while Cate Blanchett, playing the wicked Russian baddie Irina Spalko gets to wield a terrible, terrible accent with gusto, giving us exactly the kind of unabashed villain that Communists in '50s movies always looked and sounded like. Better, by far, is the work of the incredible team behind the camera. For all that it might not walk and talk like an Indiana Jones film, it surely looks and sounds and feels like one. I do not have enough words of praise for Janusz Kaminski, who has precisely aped the style of the retired Douglas Slocombe, while still making a film that looks unmistakably "Kaminski" - a hybridisation that works uncannily well, and is surely one of the highlights of Kaminski's career, if only for the inherent challenge of learning how to shoot like somebody else (and, as always, Kaminski + Spielberg + the 'scope aspect ratio = heavenly compositions). Editor Michael Kahn and sound designer Ben Burtt, unlike Kaminski, are veterans of the original trilogy, and they both bring back everything about their aesthetic that was so memorable back then. Burtt in particular deserves far more credit than he will ever receive for making this movie seem as classic as it does: close your eyes and listen to the punches and clangs and shots and above all, the whip-cracks, and you'd never know it wasn't the early '80s. Except it's obviously not the '80s, and to expect a vintage Indiana Jones adventure because the punches sound right is irresponsible. The man with the hat is back, but he's two decades older, and we feel that in every frame of the movie. The era of filmmaking that begat Raiders, Temple of Doom and Last Crusade is gone, and while we can debate the merit of making a new Indy film at all (personally, I'd have been fine without one), but since they did, we can rest fairly comfortably in the thought that Indiana Jones and the Kingdom of the Crystal Skull is just about the best we could have hoped for it to be in 2008, a satisfyingly minor continuation of the finest action-adventure franchise of the modern era.